So just how much space will you need to reserve to download the digital version of Dragon Ball FighterZ? Interestingly enough, not too much. A listing for the forthcoming fighting game has appeared on the Japanese eShop, and based on its numbers, you’re going to need about 6.2GB of memory card space if you want to add the game to your virtual collection. Granted, that is just for Japan, but the U.S. version is likely to be the same size. That’s an interesting turnaround based on what we’ve seen on previous games ported to Switch from other platforms. Usually, when a game makes the transition, it’s smaller in size, like Wolfenstein II: The New Colossus going from around 50GB to 21GB. But in the case of FighterZ, more space is actually needed, as the PS4, Xbox One and PC versions require around 4.15GB of space. More than likely, Bandai Namco boosted the size to assure that the game runs just as smoothly as its other counterparts -- not to mention not requiring it to download additional patches as extra characters are added to the game, if they’re not included already. Of course, if you prefer, you can buy the physical version of the game and save your beloved memory card space, while at the same time adding another cool title to your physical collection. That way, all you’d need to download are any updates that aren’t already on the cartridge. 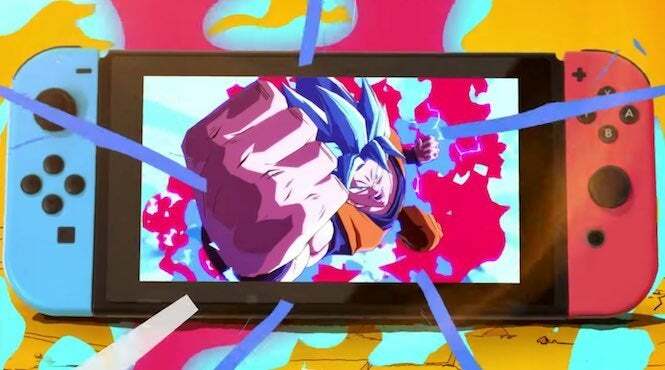 Whatever way you decide to go, Dragon Ball FighterZ looks to be quite the party on the Nintendo Switch. Its recent open beta was a huge success for players, and even managed to run pretty well online. Likewise, our previous hands-on with the game assures that it's a champ on the platform, though a final review is still pending. And that’s good news for those of you that want to take your fighting action on the go. You know, if you don’t mind playing on a JoyCon and all. You can get into the fighting action of Dragon Ball FighterZ when it releases on September 28 for Switch. Can’t wait that long? You can also get it for Xbox One, PlayStation 4 and PC right now.